Our 1920s home has a typical Heights basement that is humid much of the year. As a consequence, we use a dehumidifier to keep it at a reasonable level. (I’d prefer to not have to use a dehumidifier, but life is full of compromises.) Instead of just dumping all that water down the drain, I rigged up a system so I can use it to water plants or fill my aquarium. I simply ran a small length of garden hose from the back of the humidifier into a large plastic reservoir. 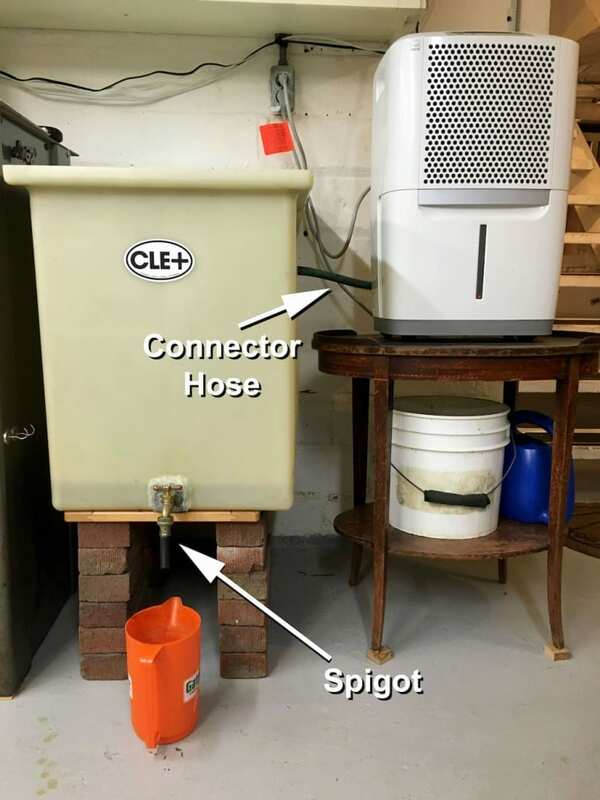 By elevating the dehumidifier on a small table, I was able to use a large reservoir that can store some 50 gallons. I also elevated the reservoir on bricks and installed a spigot so that I could easily fill pitchers and large buckets. The reservoir basically works like an indoor rain barrel. And like water from a rain barrel, the water from the dehumidifier is distilled. This is an added benefit since the fluoride in water can cause leaf scorch in some tropical indoor plants. I usually mix in some compost tea from my worm composers as a light fertilizer. During the summer, I mostly use the water outside because the dehumidifier puts out far more than I can use inside.